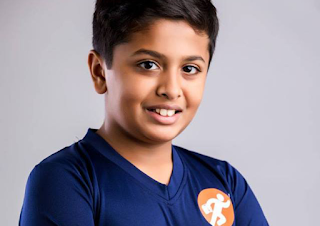 Tilak Mehta is a 13 year Mumbai boy, studying in Class VIII of a suburban school named "Garodia International School in Mumbai, Ghatkopar". His father Vishal Mehta is also associated with a logistic based company. Tilak has a twin sister Tanvi and mother Kajal Mehta, a homemaker. He recently wins the "Young entrepreneur title at the India Maritime Awards in 2018". It was 2017, when the young genius forgot some of his books to his Uncle's place, and need them urgently on the day when he sat for his studies. He needed them badly but no one was there to get them up. His father, who was arrived on late night, that day, was tired of his entire day works was not in a position to get them from the end of the city. This was the turning point from where this idea flourished inside the young mind that why not to come up with service across the city, that could ensure the same day delivery of the goods. The idea was to carry the papers and small goods across the city and guarantee the intraday delivery of the same. He discussed the idea with his father. Being a chief executive officer of the Sealink logistic company, his father was the best person to help him with his idea. He listened to it carefully and decided to put a real shape to it. The idea was initially actioned for 4 months as a Beta, then the final implementation was put into action with the collaboration of Mumbai based Dabbawalas. Young Tilak found the Dabbawala's network, the best source of delivering goods across the city. He discussed the idea with their President and convinced him to execute this Add-on to with their current Dabba service parallelly. “I was thinking about this for days and when I saw a dabbawala in my building, the idea for Papers N Parcel struck. I always marvelled at the swiftness and the efficiency of the dabbawala’s food delivery network, and I wondered if the network could be used to allow deliveries of even non-food items,”. In another interview, 13 years boy also told to the media persons that "Papers N Parcels is my dream and I will work to ensure that the business becomes big,”. PNP is entirely an App based logistic service with an employee strength of more than 200 along with over 300 Dabbawala partners. As per the study, it is currently taking care of more than 1250 deliveries per day. Any customer can download the App from the Play store, get the app installed on his mobile phone and place an order for the delivery. It has a sharp network of Dabbawalas, who deliver goods after accomplishing their daily routine work. Currently, the customer can order for the deliveries upto 3 kilos with a charge between the range of 40 to 180 INR. As per Ghanashyam Parekh - They have a client base covering Pathology labs, boutique shops and brokerage which will grow with our formal launch.